War Grave Register notes: CURRAN, Cpl. Francis Patrick, 859, D.C.M. 7th Australian Light Horse. Killed in action 5th Aug., 1916. Age 30. Son of Peter and Marcella Curran. Native of Tenterfield, New South Wales. B. 22. Francis Patrick Curran, B103 Form. Refers Lone Pine 14 August and 4-6 September 1915. I must relate one instance of the typical spirit of these light horsemen. 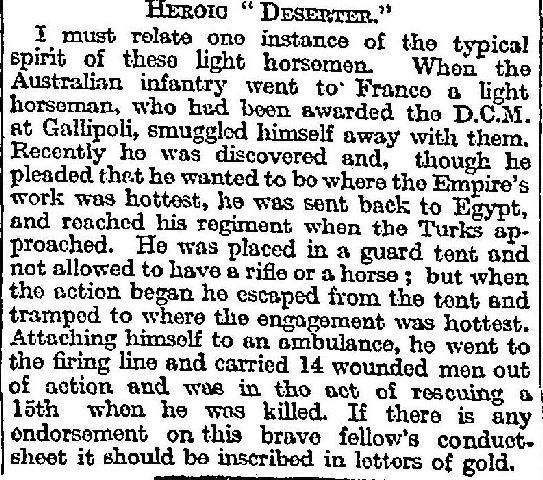 When the Australian infantry went to France a light horseman, who had been awarded the D.C.M. at Gallipoli, smuggled himself away with them. Recently he was discovered and, though he pleaded that he wanted to be where the Empire's work was hottest, he was sent back to Egypt and reached his regiment when the Turks approached. He was placed in a guard tent and not allowed to have a rifle or a horse; but when the action began he escaped from the tent and tramped to where the engagement was hottest. Attaching himself to an ambulance, he went to the firing line and carried 14 wounded men out of action and was in the act of rescuing a 15th when he was killed. If there is a endorsement on this brave fellow's conduct sheet it should be inscribed in letters of gold. Francis Patrick Curran was born in Tenterfield in 1886 to father Peter Curran (died 1900) and mother Marcella Curran nee Cameron, whom were married at Tenterfield in 1880. Frank Curran was the youngest of three. He had two older sisters: Mary born in 1881 and Alice born in 1883. Curran's interests were mainly outdoors. It would appear that he was relegated the man of the house when his father died in 1900, thrusting him into the real world at the age of 14 years. Curran's main form of employment was as a carter but he also found casual employment as a postman. Like many country boys, Curran was good at sport. During the winter he would play for the local Rugby League team where he was always considered to be a good team player. In addition, he enjoyed the occasional round in the ring boxing and sparring. When the Great War broke out in 1914, Curran did not seem to be in much of a hurry to enlist. He signed his Attestation Papers in January 1915. Curran was allotted to the 4th Reinforcements of the 7th Light Horse Regiment (7th LHR). Curran arrived in Egypt just as the 7th LHR was departing from Maadi Camp for Gallipoli. It was at this point that it became obvious that Curran was anxious to participate in some fighting. Most peculiarly, he arrived at the Gallipoli Peninsular well in advance of anyone else from his cohort. 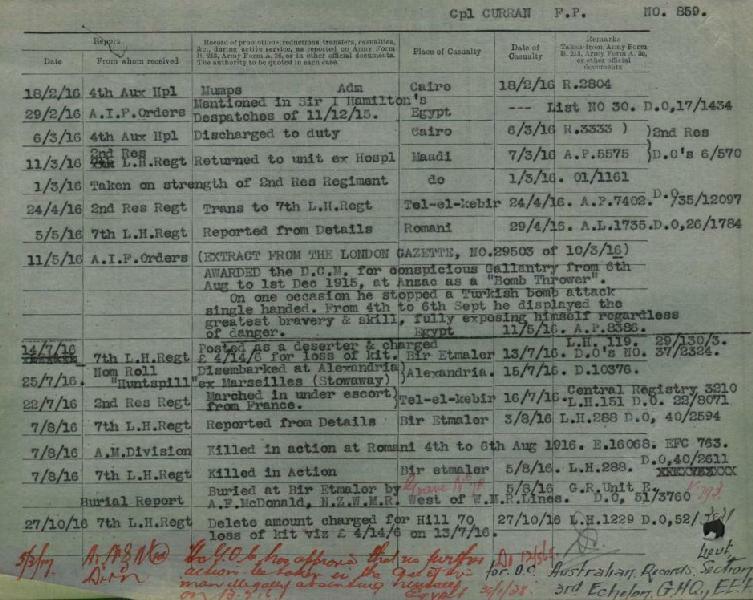 Indeed, he is recorded as arriving by the SS Commodore on 22 May 1915 and absorbed into the Regiment. Awarded the DCM for conspicuous Gallantry from 6th Aug to 1st Dec 1915, at Anzac as a "Bomb Thrower". On one occasion he stopped a Turkish bomb attack single handed. From 4th to 6th Sept he displayed the greatest bravery and skill, fully exposing himself regardless of danger. After the evacuation of Anzac, Curran, like most of his comrades came back to Egypt. In April 1916, it was decided to send only the Infantry to France and leave the Light Horse in Egypt. For some, this flew in the face of the reasons for enlisting. A few Light Horsemen stowed to France with the aim of joining the Infantry. Curran was one such person. Posted as a deserter, he was captured by the Military Police in Marseilles whereupon he was returned to Egypt under guard. He arrived at Etmaler on 3 August 1916. That night, the Battle of Romani began. The noise and activity was too much for him to sit idle that evening. Seeing his chance Curran escaped from his tent to find the Field Ambulance unit whereupon he attached himself as a bearer. During the rest of the night until the sun rose Curran toiled as a bearer. Harassed by heavy shrapnel fire, as well as by rifles and machine-guns at close range, they continued to give ground, and at about 7 a.m. the Turks gained possession of Wellington Ridge. The 1st Brigade (less the 3rd Regiment, which remained in the line) was then withdrawn to a position slightly to the north of Etmaler camp, and resistance to further Turkish progress fell for some time upon the 3rd, 6th, and 7th Light Horse Regiments and the Wellingtons, all of which were now slowly falling back by alternate squadrons. The retirement was distinguished by many acts of individual gallantry. Despite the immediate presence of the enemy, all wounded were carried back over the heavy sand. 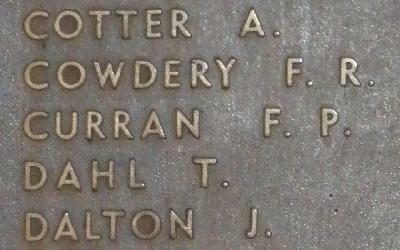 Corporal Curran, of the 7th, after bearing in a number of men, was killed while still engaged in this noble work. The day became intensely hot, and difficulty was experienced in keeping up the water supply to the men. After dark, hot tea was sent up by the quartermaster under difficult conditions, as the camp area and the kitchens were riddled with bullets, and it was close to these, that Corporal Curran, who had gained a decoration at Gallipoli, was killed after most gallantly bringing to safety a number of wounded men.